We Skyped with the San Diego kids last night: Richard-the-younger was going dressed up as an NFL ref. Parker was going to be a football player, his mom cheerleading him on. And Hudson, sweet child, was to be the stuffing in a then-limp fuzzy fleecy football they held up to the camera. A side note: I had to go to the doctor today to get the wax out of my ears that had been stopping up my hearing aids. Lots of it. The male nurse asked me what I was knitting as I put it away. It took half a heartbeat to realize that no way was I going to take his time to explain what a cowl was. 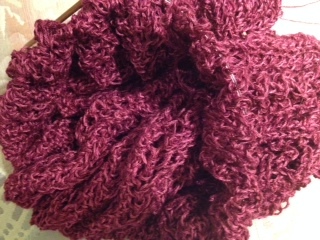 I simply said, A scarf, and hoped he didn’t notice it was pretty darn short for that and I was almost out of yarn. (Two hours left of) Happy Halloween! One of the things John did for me while he was home was he moved my big pots with my blueberry plants over by the side of the house. Six months ago we went from none to two and then three big pots at the edge of the patio below and left of the big birdfeeder. The jays learned to strafe the plants, feet grabbing berries on the go like a knitter doing stockinette stitch in the dark. They were good at this! He set up a birdnetting enclosure for me, well away from where the birds would be coming in for the meals I actually intended for them. Safflower seeds, gitcher safflower seeds, come’n’get’em! I had never connected the dots between those pots and the in-retrospect-sudden dearth of up-close sightings of the Cooper’s hawks. I’d seen so much less of them since spring but I could always tell when one was around; the other birds vanished.They knew. I had been wanting a clearer line of sight across the yard and I guess so did the hawks looking in. Suddenly there was Coopernicus, looking for the finch that had hit the window (but escaped), doing that endearing raptor waddle looking under the picnic table, lifting gracefully up to perch on the back of the chair, looking steadily in the window at me–you know, right? Where is it? Spending time right on the other side right there. Hanging out with his peeps. And again two days later. And again two days later, there on the elephant ears today where the finches often flee to, and he spread those huge wings wide and his talons reached for the far-too-small perch on the little wooden feeder just above there–but nope, nobody hiding behind. Ah well. And he zig-zagged off and away. And then to my surprise he flew right back. If I’d had leather gantlets and a piece of raw chicken he’d have landed on my arm and accepted the gift. Instead he offers me one. He’s not only been hunting for a good meal, he’s back to people-watching. I have my totem again. The male was always less skittish and more curious and I can’t tell you how good it feels to see him back. I shocked Steve. I let them have it. Nearly five hours into the two hour meeting I had had to put down the knitting and just listen to them drone on and on and sent Richard a note and my Iphone autocorrected that phrase to “inane,” capturing it perfectly, and it was oh please, please let me have my needles back. Backstory: as I’ve mentioned, we only have one car now because we spent near the equivalent of a small car on my new hearing aids. Which are fabulous. And so, when the Mountain View City Council scheduled their meeting that was essentially the redeveloper vs Milk Pail at 5:00-7:00, Stage II, Richard and I were stuck: it could go to any hour and I couldn’t strand him at work and he didn’t want to strand me from going and supporting Steve, the owner of Milk Pail, on behalf of both of us. I almost rented a car. He decided I really did need to go no matter what and made arrangements at work and simply called me at 3:45 to my surprise and said, I’m coming home now. You can go. Last time I was in those council chambers, I sat there unable to decipher any of the proceedings in that room, even with what was then state-of-the-art aids, simply a mute presence in Steve’s support, so when he shook my hand before it started tonight and thanked me for coming and asked if I would speak, I said, no, no, I don’t think so. I heard every word coming out of the councilmembers’ microphones. Who knew! Thank you Oticon! Everything, and so when they asked for public comment I leaped to my feet–yeah I had something to say, definitely. With the 1.15 million square feet the developer wants to build along SA Road, I said it was laughable that they claimed it would have zero impact on traffic on SA Road in the adjoining cities just a few blocks away (and near us). Having mentioned I lived in the town just over one, I told them, “I have shopped at Milk Pail for twenty-six years.” I cited the halal owners and told them “That is why my family and I have boycotted every business built in Stage I. My husband and four grown kids have not and will not step foot in the new Safeway; we used to shop at the old one on California Avenue” (now closed). “IF YOU SHAFT STEVE”–I looked around at them– “you are telling us You. No. Longer. Want. Our. Dollars. Trader Joe’s, Whole Foods, Safeway, Costco. I didn’t even use up my allotted two minutes. I didn’t have to. It was great seeing the developer’s head honcho getting defensive and angry in response to some of Council’s questions later. But they were too divided, and could only decide not to decide yet. Steve’s not out of the woods yet. But with 200 emails pouring in from the community and a record turnout tonight for such a meeting, demanding that Milk Pail be saved, things may be looking up. We have to keep up the pressure on the City. John leaves tomorrow. Too soon. 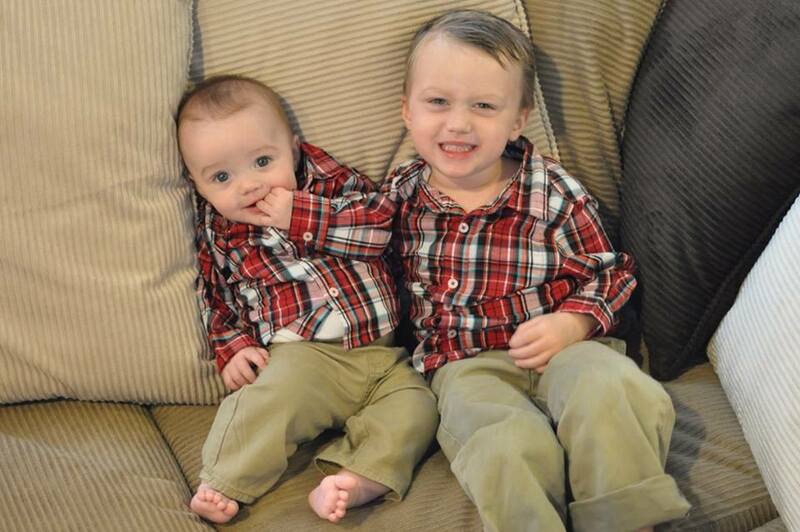 So I’m grateful for the distraction of a new Hudson and Parker photo, meantime. An online knitter who befriended me and likewise in return as of some time ago posted a question on Facebook: what is your favorite memory of Halloween? We moved to California with a baby who turned one while we were living in a hotel for a month, waiting to be able to close on our house, a toddler who would turn three a few months later, and the oldest, who turned five on moving day. John would arrive a year later. We had a neighbor who’d moved in about a year earlier herself after a divorce that it was clear she hadn’t expected nor wanted. Her kids were newly grown and suddenly there was just her now. We went out of our way to say hi when we saw her. She was shy and tended to keep to herself, and of course she had her own life with a busy work schedule, but if we saw her we claimed her for a happy moment of waving and calling out to her as we went by. 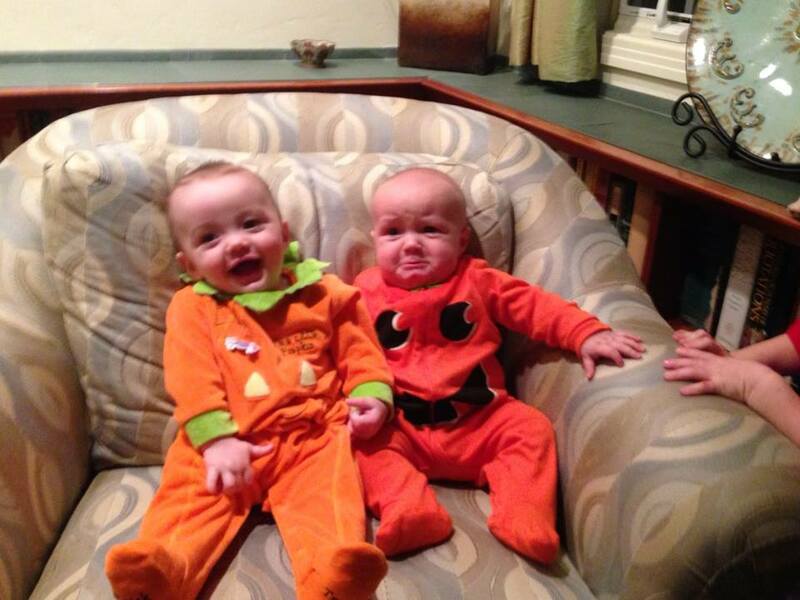 It was probably our third Halloween here that our kids got a stomach virus. There would be no trick-or-treating. No costumes. No playing dressup. No sorting through the loot afterwards that’s more than their parents would want them to have. I don’t remember if it was later that night or the next day, but our doorbell rang. …And our kids had not come. Something had to be wrong. So finally she came over to us, hoping everything was okay? She was at last claiming us in return, cementing a friendship that has stood firm for a quarter century now. And this time of year every year I remember and am grateful–even, now that that part’s long over, for that bug. For what it made clear. Oh, you’re the one who…! And the visit is half over and going far too fast. We took John and Michelle out to dinner and then she had us over for pie and it is a wonderful thing to see one’s adult children enjoying each other’s company so much. One of Michelle’s roommates, it turns out, who came home while we were there, is the sister of a friend of mine for whom I knit a baby hat in Malabrigo–late, and the baby was late, and after I got it to the mom-to-be she finally had him the next day. I think they were at the ten days point by then. I told the roommate that I had apologized to her sister for holding up his arrival. She laughed a good one. I left the pocket open. I wish I’d thought of this to add a few to Parker’s blankie when I was fixing it so that he would have a safe way to stick his hands through it like he likes to do, but at least I have the idea now. One funny thing about marrying a kid whose parents were friends with mine all the way to when they were newlyweds is that my in-laws once showed me a picture from way back then of my dad when he actually had dark in his mustache and some color still in his hair. Which I had never seen. I know, I know, John’s still brown on top with red in his beard–quick, before he goes! Take pictures! Before John gets here, thought I’d mention. 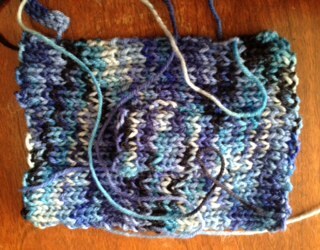 While waiting for Richard at his doctor’s appointment this morning, I worked on an 8″ square(ish) to go in a baby afghan for someone at Purlescence–and I gave it a little pocket. But it occurred to me: if I don’t sew the bottom shut, then I have reversible pockets, one on each side, but not really pockets because it goes through to the other side at the bottom. Remembering Parker and his blankie, it would be a safe way for a little one to stick their hand through their blankie without tearing anything. I have not sewn that bottom shut. Should I? John’s coming home, John’s coming home! Tomorrow, for a friend’s wedding. I can’t wait to see him! And so today I knit pretty much all day, with breaks as my hands needed, to get Paige’s project as far along beforehand as I could. I was sitting waiting for a prescription to be filled, my instructions a piece of typed paper on my knee that I checked from time to time, my cloudweight of lace in my hands. An elderly woman (Chinese?) was silently entertaining herself in her nearby seat by watching me knit. I rather wished I had spare yarn and needles there to offer to share with her. I looked up from time to time and smiled and nodded hello; she smiled back. I held the glance for just a moment the next time, trying to give her permission to speak up if she wanted to. She simply smiled back. I went on with what I was doing. And then I went fishing through my purse, crossed out the ( and the ) and the word twice and scribbled in what it should have read there, tweaking the pattern. And suddenly noticed the woman was startled, staring, perhaps even a bit distressed. Was it that I wrote on the page? That I was making it up as I was going along? (I partly was.) I wasn’t sticking to the script! I *wrote* over the instructions! At that point I really would have loved to have had a conversation, to have found out where she was coming from, what stories were behind those eyes, what they had seen, but for whatever reason, be it language differences or simply the ongoing quiet, the words didn’t break through. Goodness, honey, I didn’t mean to bother… I mean… Too funny. Huh. I smiled I hoped encouragingly and knitted on, and she settled back into watching me do so. We went back to as we were. Then the pharmacist called my name, I tucked it all away, and that was that. Soft grays, turquoise, I was told when I asked what Paige’s favorite colors were. I found one single taupe-ish gray ball in my whole stash and it just didn’t seem the thing. But I happened to get an email from Cottage Yarns in South San Francisco: the store was bursting with yarn orders and everything was 20% off to try to help her clear out some space. I talked to Richard about it and then headed on up Saturday. Kathryn has a lot of Malabrigo yarns and Malabrigo never goes on sale and, much though I don’t think of myself as the brand-conscious type, I adore anything they produce and the people who produce it: if it’s Malabrigo, it’s very soft, and I love that I’ve gotten to know the owners a bit at Stitches every year. And Kathryn was right–when I pulled out bags of Silkpaca to try to see the colors of the ones stacked up behind them, they were packed in so tight it was hard to get them back in the cubby (and one doesn’t want to make a mess). Bags and bags and bags of woolly goodness everywhere–I tell you, if I ever have to be in a building in a major earthquake again I want it to be that one. But there you go: I did, I found a soft gray in there, baby alpaca/silk laceweight, Polar Morn colorway, perfect. I didn’t find what I was looking for turquoise-wise, but one thing at a time. I have about 500 yards of a cobweb-fine bright turquoise cashmere/silk that needs to be double-stranded with something similar in color and softness that I was trying to match up; I’ll find it. (Or dye something from stash.) But let me get this soft gray done first. I got to tell her how much Hayes’s mom had loved the blankie she’d helped come to be. (The green, that’s from her.) That alone was reason enough to make the drive up there; she was thrilled. And I love that she was cheering Hayes on after his rocky start to life. And so with the silk/lycra project blocked and out of the way, and with me healthy now, I got started for my cousin-in-law. Three hours nonstop of laceknitting creates so much fabric. Three hours of nonstop laceknitting makes such a tiny thing. 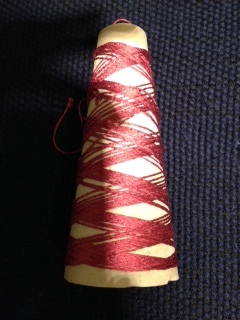 Three hours nonstop of knitting lace by the second time around actually does begin to make a goodly bit of fabric. (Break out the icepacks.) I just had to remind myself it was one single stitch when I started yesterday. Tomorrow I again get the privilege of doing something for Paige to cheer her on in her fight: knitting is a gift that gives both ways. I look forward to all the individual moments I will never know of when she will wrap warmth and love and comfort and color around her and know that she is not alone. Got my flu shot today. And so I had the car, and as I was coming to pick Richard up from work, I found I had to stop rather than pull into the company’s driveway; it wasn’t a busy street in that direction at that hour and there was nobody coming up behind me, so that was okay. There was a coyote crossing that driveway right in front of me. And then it passed by the side of my car. It was not trying to thumb a ride. Another woman just then was leaving that parking lot that I was to turn into, and she too stopped to stare. (I was both staring at it and repeatedly checking for traffic.) After what seemed like forever she took her eyes off it to look over at me to make sure I didn’t miss out–DO YOU *SEE* THAT?! I mouthed WOW! back. Another car came up behind her and that driver too did a doubletake, and he watched. Nobody was in any hurry. The coyote raised her head and sniffed and looked around to get her bearings. I’ve seen one in the wild before at quite a distance, but never anything like this. Long, long thin legs, long ears, a speckled top of the coat. What a view. Wow. Wow! But turn around, I thought at it, go back up that hill, it’s all city from here on down. 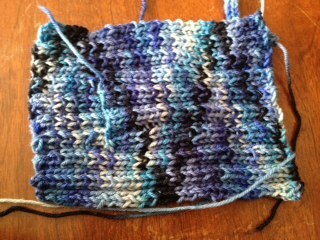 Let’s see, twelve rows so far, 405 stitches each…. Not bad work for a day.